CLEVELAND, Ohio -- Cuyahoga County prosecutors will seek the death penalty against a Cleveland man charged with killing the owner of a car dealership and his wife during a botched hold-up. Joseph McAlpin, 30, was indicted Friday in connection with the April 14 killings of Michael Kuznik, 47, and Trina Tomola, 46, at Mr. Car's on East 185th Street. McAlpin is also accused of shooting the couple's Rottweiler. The 25-count indictment includes charges of aggravated murder, aggravated robbery, aggravated burglary and lesser offenses. The charges include specifications that would make McAlpin eligible for the death penalty if he is convicted. McAlpin, who has been jailed on a $5 million bond since June, will be arraigned Thursday on the new charges. Tomola's son went to the dealership about 9:30 p.m. because she and Kuznik never returned to their Euclid home after work. The 19-year-old son found them dead in the business. Kuznik was found near his desk with a gunshot wound in the back of his head, with no apparent signs of a struggle, police said. Tomola was found near a back door with a gunshot wound to the back of her head, leading investigators to believe she was trying to run away when she was killed. Two assailants stole two cars from the lot and a bag of car keys, which investigators later found ditched in a Cleveland park. The attackers also stole surveillance equipment and computers that contained records of purchases from the store, police said. Detectives have not identified the other person involved in the slayings. McAlpin was linked to the killings through DNA evidence, court records say. CLEVELAND, Ohio -- Two more suspects are charged in the April 14 slaying of a couple at their used-car business in Cleveland's Collinwood neighborhood. Jerome Diggs Jr., 23, and Andrew Keener, 24, both of Cleveland, are each charged with aggravated murder in the deaths of Michael Kuznik, 47, and Trina Tomola, 46, officials announced at a Monday news conference. The men appeared for arraignment on Monday, when a Cleveland Municipal Court judge set their bonds at $1 million apiece, court records say. A third suspect, Joseph McAlpin, 29, was arrested in June, and a grand jury later handed up a 25-count indictment against him, including charges of aggravated murder, aggravated robbery, aggravated burglary. He's also accused of shooting the couple's Rottweiler, Axel. Prosecutors are seeking the death penalty against McAlpin. Kuznik and Tomola were "basically executed" inside Mr. Cars Inc. on East 185th Street as they were preparing to close their shop for the day, Cleveland police Chief Calvin Williams said. Investigators on Monday did not say why they believe Diggs and Keener are linked to the killings, but attributed the developments to detective work and tips from the public. 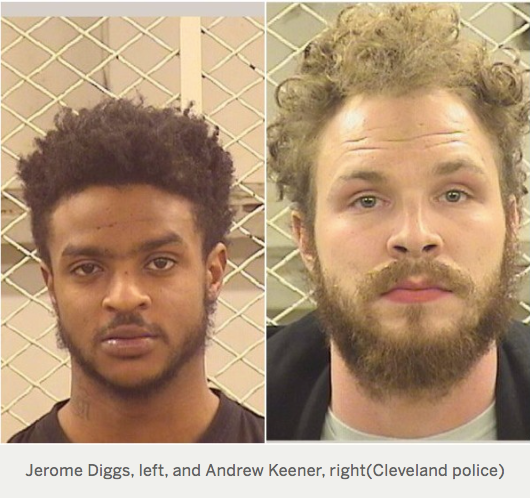 CLEVELAND, Ohio -- A Cuyahoga County grand jury has charged two men accused of acting as accomplices in the April killing of a couple at their Collinwood car dealership. Jerome Diggs Jr., 23, and Andrew Keener, 24, both of Cleveland, are each charged with multiple counts of aggravated murder, aggravated robbery, cruelty to animals, grand theft and other charges in the deaths of Michael Kuznik, 47, and Trina Tomola, 46. The two men are accused of helping Joseph McAlpin rob the Mr. Cars lot on East 185th Street as Kuznik and Tomola closed for the day on April 14, prosecutors say. McAlpin shot Kuznik and Tomola each in the backs of their heads inside the office of their East 185th Street dealership, prosecutors say. He's also accused of shooting Axel, the couple's Rottweiler. Cuyahoga County Prosecutor Michael O'Malley's office is seeking the death penalty against McAlpin. CLEVELAND, Ohio -- The Cleveland man facing the death penalty in an slaying of a couple at their East Side car lot told a judge Tuesday that he no longer wants to represent himself at trial. Joseph McAlpin, who is being jailed on $5 million bond on multiple counts of aggravated murder, said in court that he had decided not to represent himself after talking to his court-appointed attorneys, Fernando Mack and Joseph Pagano. "I kind of think I'm going to back up off that one," McAlpin told Cuyahoga County Common Pleas Judge Brian J. Corrigan Tuesday morning. McAlpin is accused of shooting and killing Michael Kuznik and Trina Tomola in April at the office of Mr. Cars II on East 185th Street. He then stole a bag of car keys, the business's surveillance equipment and two used cars from the lot. Jerome Diggs Jr. and Andrew Keener, who stand accused of helping McAlpin, were indicted Monday on aggravated murder charges. McAlpin made the initial request to represent himself during an October pre-trial hearing. Corrigan ordered McAlpin to undergo a psychiatric evaluation to ensure that he was competent enough to represent himself, but McAlpin refused to cooperate with the order, Corrigan said in court Tuesday. McAlpin told Corrigan that he made the request out of frustration because, after spending five months in jail, he said he has yet to see much of the evidence against him, including results from DNA tests that prosecutors say tied him to the killings. "There's a lot of things that I don't understand that I wish to be answered," McAlpin said. Corrigan ended the hearing after McAlpin dropped his request to represent himself. McAlpin asked as a sheriff's deputy led him out of the courtroom if a trial date has been set. "Not yet, we're too early," the judge replied. Last edited by Helen; 11-21-2017 at 01:09 PM. Reason: Come on half the article was missing...why?? Cleveland, Ohio - The murder trial for Joseph McAlpin, the man accused of gunning down a couple who owned a car dealership in Cleveland, is set to get underway Monday. Jury selection will begin around 9am Monday morning but they say it could take up to a week to select the jury because this is a capital murder case. Prosecutors are seeking the death penalty for the 31-year-old. Police say Joseph McAlpin and two others broke into Mister Cars on East 185th Street in April of 2017. They say McAlpin killed the owners, Trina Tomola and her husband, Michael Kuznik. The couple�s 19-year-old son was unable to get in touch with them. He then found them both shot in the head at the car lot. McAlpin is also accused of shooting and killing their dog. Police say two cars, surveillance equipment and computers containing business records were taken from the business. The two other men allegedly with McAlpin, Jerome Diggs and Andrew Keener, were arrested as well. Kenner has pleaded guilty. Cleveland police identified McAlpin as a suspect through DNA evidence and arrested him on June 13th. He was originally indicted on 25 counts, including aggravated murder, aggravated robbery, kidnapping and cruelty to animals. A Cuyahoga County grand jury returned a new indictment with death penalty specifications against him. CLEVELAND, Ohio � Michael Kuznik and Trina Tomola wanted to close up their used car dealership and pick up fish dinners for their two kids before they returned home on Good Friday. Before they finished, Joseph McAlpin carried out a plan to steal cars to turn into quick cash, killing the Euclid couple along the way, a prosecutor said Tuesday during opening statements in McAlpin�s capital murder trial. Assistant Cuyahoga County Prosecutor Russ Tye said that McAlpin shot the two at close range and tried to cover his tracks by stealing the dealership�s video surveillance system. He left behind DNA evidence that linked him to the April 14, 2017 slayings at Mr. Cars Inc. dealership in Collinwood that set off an uproar in the community, Tye said. McAlpin, in a rarity for a death-penalty case, is representing himself in the trial in front of Cuyahoga County Common Pleas Judge Brian Corrigan. McAlpin denied committing the crime in his opening statement. Tye said along with DNA, cellphone data and surveillance video show that McAlpin, 31, carried out the shootings of Kuznik and Tomola, who left behind three children between the ages of 6 and 19. A co-defendant is slated to testify against McAlpin, prosecutors said. McAlpin�s father founded the car dealership in 1977, and he took over operations in 2005. The night of the shooting, about 4 p.m., McAlpin placed a call to the dealership. His brother, Jerome Diggs, and his brother�s friend, Andrew Keener, agreed to go to the dealership to steal cars, sell them and split the cash, Tye said. They drove together and parked on Winward Road about a block away from the dealership. McAlpin went inside. The two others stayed near the car, Tye said. Once inside he shot Kuznik, 47, in the showroom, Tye said. The bullet him in the face. Kuznik ran to a backroom, where McAlpin stood over him and shot him in the top of his head, Tye said. Investigators found McAlpin�s DNA in Kuznik�s back pocket, where Tye said he put cash from two car sales earlier in the day. The cash was stolen, Tye said. Tomola, 46, tried to run from the building during the robbery. McAlpin shot her in the back of her head, near an exit, Tye said. McAlpin�s DNA was found on a modem inches from Tomola�s body, Tye said. McAlpin also shot and killed the couple�s Doberman Pinscher, Axel, that accompanied the couple to work every day for protection, Tye said. He disabled and stole the surveillance system and calmly walked into the parking lot, where he changed the license plates on a BMW and a Mercedes he planned to steal, Tye said. He called Keener, who drove away in the Mercedes. McAlpin took the BMW, Tye said. Cleveland police later found it with McAlpin�s DNA inside, Tye said. Tomola�s son grew concerned when the couple didn�t return home after work. He drove to the dealership, spotted his mother lying in a pool of blood and called 911. Keener, who pleaded guilty Feb. 25 to involuntary manslaughter, is expected to testify against McAlpin as part of his plea agreement. Diggs has pleaded not guilty to aggravated murder and other charges. His trial has not yet been set. While McAlpin�s opening statement cannot be used as evidence in the case, he denied the killings and never offered another version of events, including where he was at the time of the killings. He argued that Cleveland police rushed to place blame on someone for the crime because of the outrage in the community over the slaying. Cleveland City Councilman Mike Polensek, who attended opening statements on Tuesday, was a vocal critic of the slayings, saying that the mayor failed to prioritize safety in his ward. McAlpin said surveillance video from another car dealership across the street was poor quality. He said viewers wouldn�t be able to see a face, let alone the race of the person stealing the cars from the lot. He told the jury he had prior convictions for burglary and armed robbery, but that he cooperated with investigators. McAlpin said his DNA would have been around the dealership because he shopped for cars there three times, including once with his wife. He also questioned Keener�s motives for agreeing to testify at trial. �A chicken is going to scream until it gets out of the oven,� he said. 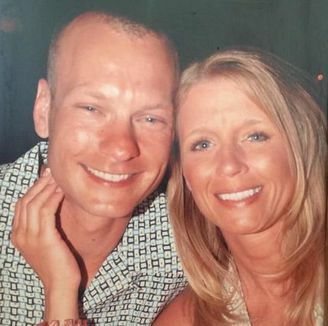 CLEVELAND, OH (WOIO) - Joseph McAlpin, one of three suspects being tried for the murders of Trina Tomola and Michael Kuznik, is representing himself in the capital punishment case and is maintaining his innocence. During the trial�s second day, McAlpin expressed his sympathy to the victims� family while cross-examining the couple�s 19-year-old son. �For what it�s worth, my deepest condolences,� McAlpin said during Wednesday�s questioning. Opening statements in McAlpin's trial were heard Tuesday afternoon. When testimony resumed on Wednesday, prosecutors presented the police body camera video footage taken the night of the murders. McAlpin, the alleged mastermind in the crime, faces more than two dozen charges in connection to the murder investigations. Police say this surveillance footage shows Joseph McAlpin at the scene of two murders. Police body camera video shows officers arrive at the scene that night. They find the victims� son in the parking lot. He didn�t want to be on camera in court Wednesday, but told the jury he came looking for his parents when they didn�t come home. Footage shows what the then 19-year-old described seeing as he approached the dealership office. �Pictures were crooked, chairs on their sides, the candy machine was fallen over and broken,� their son said. Their son eventually found the worst case scenario-- his parents� dead bodies. Standing in the parking lot the son then realized something else. �There�s a lot of cars missing,� he told officers. Investigators found the couple and their dog slain at a Cleveland-area car dealership on East 185th Street in 2017. Andrew Keener previously pleaded guilty to involuntary manslaughter and theft on Feb. 25 in connection to the investigation. The third suspect and McAlpin�s brother, Jerome Diggs, has a pre-trial court appearance scheduled for April 30. CLEVELAND � They were once accused in the same murders, but Andrew Keener and Joseph McAlpin were pitted against each other as McAlpin's murder trial continued Friday. McAlpin could face the death penalty if convicted of the April 2017 murders of Michael and Trina Kuznik. The couple were found shot to death along with their dog inside the Mr. Cars dealership they owned. Keener cut a deal with prosecutors, agreeing to testify against McAlpin in exchage for a maximum of 15 1/2 years in prison. Keener told jurors he went along with McAlpin and his brother believing they were going to steal cars and sell them. But in court McAlpin, who's representing himself at trial, tried painting Keener as a drug addicted liar who agreed to implicate others to save himself. "I didn't lie about implicating nothing about nobody," said Keener. "I didn't just pick you off the side of the Earth and put in this," he told McAlpin. But McAlpin showed jurors a video that proved the 25 year old was walking in front of a phone store at the time he testified he was sitting in the car waiting for McAlpin. He also questioned Keener's claims that he initially lied to investigators because he feared for his family's safety. "How could you possibly be worried about your family's well-being, being up for 30 straight days using meth?" asked McAlpin after Keener testified he was high and hadn't slept in weeks when police arrested him. Prosecutors painted Keener as a marked man behind bars because of his cooperation in the case. Keener told jurors he would have testified against McAlpin even if he didn't get a deal from prosecutors, calling the accused murder "cruel" and "devastating." "I need to do what's right, and I need to make sure that everybody that lost their families get justice for them," said Keener. Prosecutors are expected to wrap-up their case sometime next week. Then McAlpin is expected to start calling witnesses in his defense. CLEVELAND, Ohio -- The Google account associated with Joseph McAlpin searched nearly the exact year, make, model and color of a car that prosecutors say he stole after executing a couple inside their Collinwood car lot, an FBI agent testified Monday. Data culled from the cellphone towers showed that McAlpin�s cellphone pinged off towers and wireless internet routers near Mr. Cars Inc. on East 185th Street at the same time investigators believe McAlpin carried out the April 14, 2017 killings of Michael Kuznik and Trina Tomola, the agent said. FBI Agent Jacob Kunkle�s testimony came on the 10th day of McAlpin�s trial on multiple charges including aggravated murder. If convicted, McAlpin faces the death penalty. The cellphone records presented Monday largely corroborated last week�s testimony of Andrew Keener, who said he agreed to help McAlpin and McAlpin�s brother, Jerome Diggs, steal cars from the dealership so he could get money for drugs. Keener pleaded guilty Feb. 25 to involuntary manslaughter, and agreed to testify against McAlpin as part of his plea agreement. He faces anywhere from six years to 15 years in prison. Diggs has pleaded not guilty to aggravated murder and other charges and his case is pending. Keener testified on Thursday and Friday that McAlpin and Diggs met him at East 141st Street and St. Clair Avenue just before 5 p.m. April 14, 2017, and asked him to help carry out the crime. Both of their cellphones �pinged� off of towers that covered that area, Kunkle said. Keener said the trio drove to the dealership together and parked on a side street, when McAlpin got out of the car to go to the dealership. Cellphone records showed the men�s phones traveled together to the Collinwood neighborhood, then McAlpin�s phone was tracked on East 185th Street and spent about 11 minutes within half a football field of Mr. Cars, Kunkle said. Surveillance video already played at trial showed two men driving off the lot in a 2006 Mercedes Benz SL430 and a silver 2008 BMW 528i about the same time. Keener testified that he drove the Mercedes off the lot and McAlpin drove the BMW. Kunkle said records showed in the hours that followed both men�s cellphones pinged on towers from East 185th Street to Newburgh Heights through downtown, then back up to an area of West 48th Street in the city�s Ohio City neighborhood. Investigators pinpointed the location of McAlpin�s phone using a combination of cellphone tower data and Google records, Kunkle testified. Several hours after the killings, Google records showed McAlpin made multiple internet searches including �all 2008 Salvage BMW for sale" and �can you switch a title into your name without the other parties permission,� Kunkle said. The searches related to the BMW got more specific through the night up until about 4:35 a.m., when McAlpin�s account searched �2008 BMW gray 521," Kunkle said. A week later, McAlpin�s account searched for the �latest news on the stolen bmw from car lot murder," Kunkle said. McAlpin, who is representing himself, questioned Kunkle about his ability to determine who was using his cellphone and Google account. Kunkle readily admitted that he could not determine who making the searches. The evidence adds to the case that prosecutors have built against McAlpin. Prosecutors say he entered Mr. Cars and shot Kuznik, 47, in the showroom. The bullet grazed Kuznik�s face, and McAlpin stood over Kuznik and fired another shot into the top of his head, prosecutors say. Investigators found McAlpin�s DNA in Kuznik�s back pocket, where prosecutors said he had put cash from two car sales earlier in the day. The cash was not found on Kuznik�s body. Tomola, 46, tried to run from the building during the robbery. McAlpin shot her in the back of her head, near an exit, prosecutors said. Investigators recovered McAlpin�s DNA from a computer modem that was inches from Tomola�s body, prosecutors said. McAlpin also shot and killed the couple�s Doberman Pinscher, Axel, who accompanied the couple to work every day for protection, prosecutors said. He also disabled the car lot�s security video systems before stealing the cars. CLEVELAND, Ohio — The man accused of executing a couple at their used car dealership sought to poke holes on Monday into the police investigation into the double-homicide in his last effort to convince a jury of his innocence. Joseph McAlpin, 31, who is believed to be the first defendant to represent himself in a capital murder in Cuyahoga County history, told the jury during his closing argument that he didn’t kill Michael Kuznik and Trina Tomola at the Mr. Cars Inc. dealership in April 2017. “I’m not a monster,” he said. If the jury finds McAlpin guilty of the most serious charges of aggravated murder, he’ll face another round of testimony in the penalty phase of the case. The jury will then recommend to Cuyahoga County Common Pleas Judge Brian Corrigan death or life in prison. Corrigan ultimately makes the decision on what sentence to impose. McAlpin pointed out that prosecutors had no eyewitnesses to the shooting and no video evidence of what happened inside the Collinwood used car lot. He criticized the DNA evidence prosecutors said showed he was inside the used car dealership and in a BMW that was stolen during the robbery. McAlpin also said he did not have his phone at the time of the slayings. Investigators used information from the cellphone, including Google Location Services and cellphone tower pings from McAlpin’s phone. And he called prosecutors’ star witness, co-defendant Andrew Keener, a liar who told police what they wanted to hear to spare himself. Keener pleaded guilty to involuntary manslaughter and testified against McAlpin at trial. He testified that McAlpin recruited him and McAlpin’s brother, who is also charged in the case, to steal cars from the lot for quick cash. Keener awaits sentencing. Assistant Cuyahoga County Prosecutor Brian Radigan in his closing argument said without eyewitness testimony, and with the dealership’s surveillance video being destroyed during the robbery-turned-homicide, that investigators pieced together the case with DNA and cellphone information that showed McAlpin was the only person inside the business at the time of the slayings. The couple and their dog Axel were killed execution-style inside the lot on sometime between 5:30 p.m. and 6:30 p.m. on April 14, 2017, Radigan said. Radigan said a customer left the store about 5:03 p.m. McAlpin and Keener were talking on the phone about 16 minutes. About 5:22 p.m., Kuznik and Tomola finish closing up outside the lost and walk back inside, followed by McAlpin about two minutes later. Tomola talked to her 13-year-old daughter about 5:28 p.m. and another person about 5:30 p.m., as McAlpin was inside the building, Radigan said. The prosecutors have not said if the owners knew McAlpin was in the building, but McAlpin said during his opening statement that he went to the business several times to test-drive cars. No one emerged from the building for more than an hour. Prosecutors said during the trial that during that time, McAlpin shot Kuznik in the face, then again at point-black range on top of his head. He also shot Tomola in the head at close range as she tried to run out of a back exit, prosecutors said. Radigan said McAlpin about 6:31 p.m. calmly walked out of the building, switched license plates on two cars, called Keener and drove off in a BMW. Radigan said investigators found McAlpin’s DNA on a modem found inches from Tomola’s body, in Kuznik’s back pockets and in the stolen BMW. Google Location Services put McAlpin’s location at the store at the time of the slayings, Radigan said, as did information from cellphone towers. The Google locations stopped around 5:30 p.m., which Radigan said happened because the modem with McAlpin’s DNA on it was ripped from the wall. Cellphone towers later put McAlpin’s location on West 48th Street, where police found the stolen BMW, Radigan said. McAlpin’s Google searches in the hours and days after the slaying showed he searched for information about how to sell a 2008 BMW 528i, the exact car that was stolen from the lot. He also searched for news updates on the investigation. Radigan said that amount of circumstantial evidence could not be chalked up to a coincidence.